On to the polish! It takes 2 coats for this polish to be opaque and the formula goes on like a dream. Grand Prospect Holo shifts from blue to purple with a healthy dose of holographic glitter for good measure. It’s shown here with a glossy top coat. It’s so gorgeous on its own that I am not doing any nail art on this one. Isn’t this polish just beautiful? Unfortunately, the only way you can get your hands on it now is in polish sale groups on Facebook or in someone’s destash (a destash is when someone sells part of their collection, or stash.) There are tons of beautiful polishes for sale, though, at www.kbshimmer.com. She just came out with gorgeous multichrome and neon collections. She also has great bath and body products. I have the Pink Sugar lotion and get tons of compliments on it whenever I wear it. Thanks for visiting the blog and I will have more pretties to show you soon! I died a little every time I saw this polish before the Con. It was the first thing I picked up when I was there. I love it so much! I had my heart set on the blue one, but I’m so glad I got this too. It’s so gorgeous. I just love this multichrome. KBShimmer is always on top of the game! Aw you should have gone! I was working the KB table! Next time. Love this on you! Next time I definitely will. I wish they’d stay on the east coast in spring! 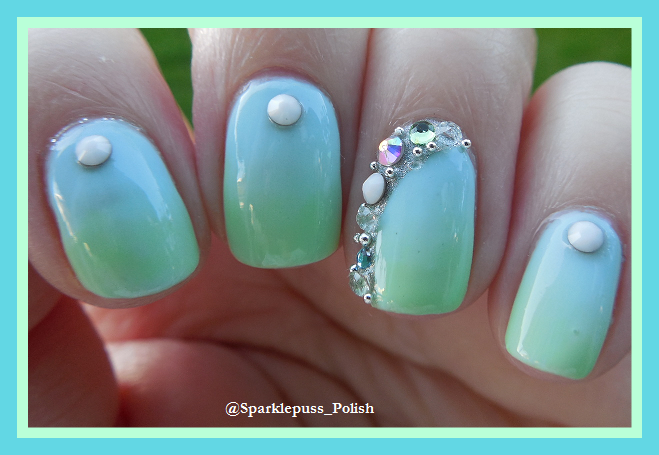 This is such an amazing polish!